This is something we have been wanting to try for a while at Swankfood since I had one of my nicest meals in Spain cooked this way. That particular fish was a whole Turbot baked in a coating of salt over wood fire. However that particular method is fairly challenging to control the temperature so for this we stuck with a traditional oven. The fish we used was a whole salmon that Ian got from St Georges Market early on a Saturday morning, apparently straight off the boat three hours before. The idea is that the salt creates a mini oven around the fish which allows it to steam in its own juices and take on the flavours of what ever you chose to stuff it with. It may look slightly complicated but it's a simple and fool-proof way to cook a whole fish and acts as a wonderful centre piece for a dinner party. To accompany the fish we went for a Scandinavian vibe with pickles that created a wonderful and light meal. 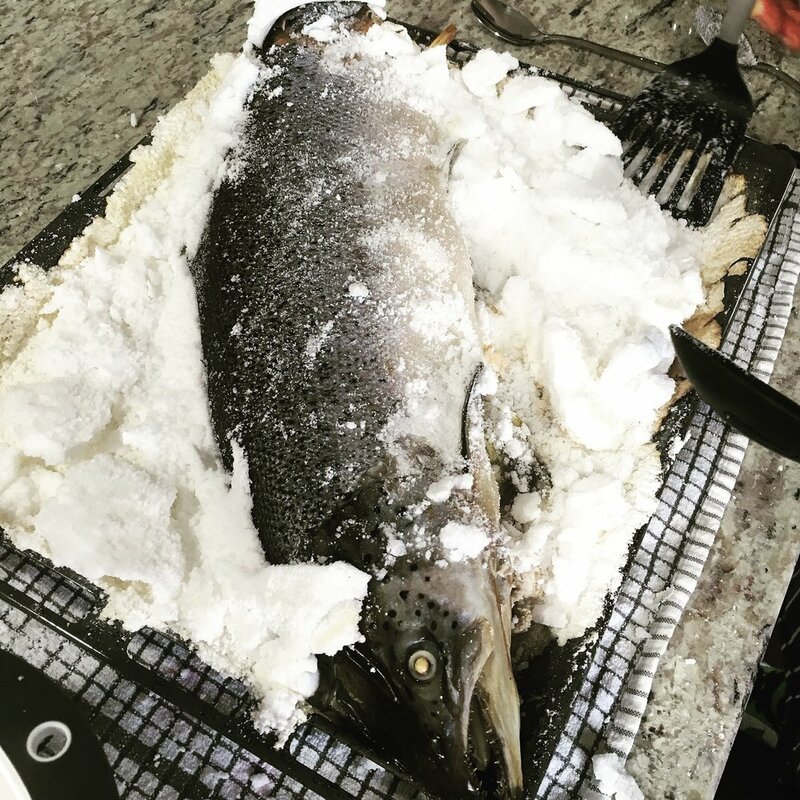 The fish was already gutted and scaled so there was fairly little in the way of preparation needed. For the salmon simply fill the cavity with the slices of lemon and dill. You want just enough so the fish can still close without the contents spilling out. For the salt you are looking to add just enough water so it feels like very wet sand. If it holds its shape without cracking you are good to go, if not just add more water. Once the fish is fully coated place in a pre-hated oven at 200°c for 50 mins. This was a very large salmon hence the cooking time so if you have a smaller fish adjust the time to suit. Once cooked then comes the fun part! The salt should have formed a rock hard crust and started to turn a brownish colour on the outside. If you are careful enough you should be able to crack the crust then with a knife and lift away the salt in slabs to (hopefully) reveal a perfectly cooked fish. With this method of cooking the skin will be soft unappealing to eat and is easy to remove. Simply slice along the back bone, then from the back bone down the side of the fish behind the gills to the belly. Once this is done the skin should come away in one piece. As the fish has effectively poached in its own juices the flesh is extremely tender and very easy to remove. Slide the knife horizontally along the back bone to loosen then delicately slide portions onto a serving plate. Once you have removed all the flesh turn the fish over and repeat the same process on the other side. Pickling is a great way of preserving veg, I find that it goes particularly well with salmon as the acidity adds another dimension to the sweet nearly oily fish. Not to mention it's the easiest thing to do. First slice all your vegetables and set to one side. Add your spices to a dry saucepan and toast for 2 minutes and take off the heat. Add the veg to the sauce pan with the herbs and cover with equal parts cider vinegar to water. Bring the mixture to the boil, reduce the heat and cook until the veg is al dente. At this stage decant all ingredients into a sealable container and leave overnight before serving. We served our salmon with these lovely pickled veg and the best Potato salad.